Want to give your aging concrete a fresh, new look? Looking for a low-cost and durable floor system to cover dusty and porous concrete? 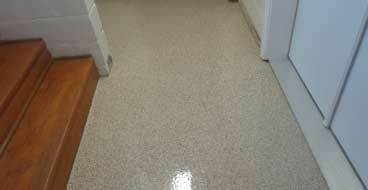 As one of the leading epoxy flooring contractors in the Fort Wayne area, we offer custom solutions to fit your budget. Our concrete epoxy contractors serve homeowners and commercial customers alike with high-quality epoxy systems that can last decades. We also offer other affordable and protective concrete solutions like basement waterproofing, concrete sealing, and stamped concrete. With our epoxy concrete contractors, you can reimagine the possibilities of concrete. Discover why epoxy flooring is rapidly growing in popularity for residential applications like basement and garage flooring. Think you know epoxy flooring? You have probably seen it many times in retail stores, fitness centers, and medical facilities but there’s a lot more to epoxy than commercial applications. Indiana homeowners have a lot to appreciate about concrete epoxy coatings including a long life of up to 25 years, an unlimited number of design options, and the durability to withstand daily wear and tear. 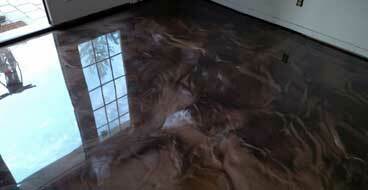 One of the most popular uses for residential epoxy is basement floor epoxy and sealer in Fort Wayne. A basement epoxy coating turns dusty, dark, and musty basements into bright, clean, and comfortable living spaces. Basement epoxy won’t be damaged by water and it stops moisture from traveling up through your concrete foundation. It can last up to 25 years and lighten your basement by up to 300%. Epoxy flooring is also perfect for updating your garage and turning it into bright and useable space. Whether you want a clean place to park your car and store your belongings or you want to turn your garage into your own personal workshop or fitness room, garage epoxy in Fort Wayne, Indiana makes a great investment. Garage floor epoxy withstands road salt, gas and oil spills, abrasion, and hot tires with ease, stops concrete dusting for good, and brightens your dark garage with attractive and colorful flooring. Epoxy flooring is the ideal investment for any commercial facility thanks to its versatility, long-lasting durability, and low lifecycle cost. 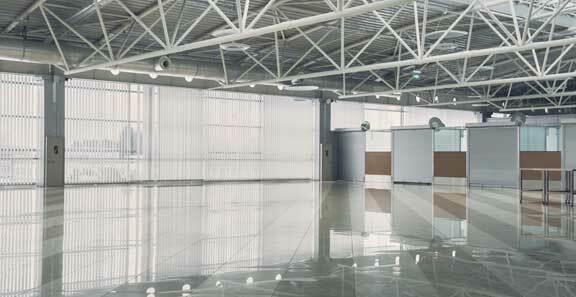 Virtually any commercial property can benefit from a commercial concrete epoxy coating. Our professional-grade epoxy solutions increase the tensile strength and weight capacity of your existing concrete while protecting it from damage from spills, foot and vehicle traffic, and corrosive chemicals. Epoxy isolates spills on its surface thanks to its seamless and nonporous surface and withstands even heavy-duty abuse, abrasion, vehicle traffic, and more. We serve residential and commercial customers with a host of concrete services. Epoxy flooring isn’t just for commercial settings. It’s rapidly gaining popularity among Indiana homeowners for its seamless, high-gloss, and attractive surface that’s long-lasting and incredibly resilient. You can enjoy industrial-grade yet decorative epoxy flooring in many areas of your home to say goodbye to ugly and dusty concrete for good. Garage floor epoxy in Fort Wayne and New Haven turns your garage into a showroom without the oil and gas stains. In the basement, it can withstand moisture without a problem to both waterproof and renovate your dark basement. 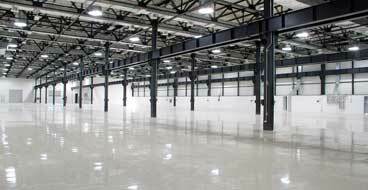 Few floor systems offer the long list of benefits you can enjoy with Fort Wayne commercial epoxy flooring. Business owners and facility managers appreciate the low lifecycle cost of commercial epoxy thanks to its durability, low installation cost, and longevity. A commercial epoxy floor coating can be adapted to fit almost any environment from commercial kitchens and healthcare facilities with strict hygiene requirements to high-end hotel and office lobbies, storefronts, and even breweries and factories. We install specially formulated commercial concrete epoxy built to withstand even the harshest environments. A metallic epoxy floor is the perfect solution to achieve an impressive “wow” factor for your business, basement, or garage. Metallic epoxy is a one-of-a-kind floor system that offers the same benefits as regular epoxy flooring but with a pearlescent, three-dimensional appearance. Every metallic epoxy floor coating is unique and our epoxy contractors have the experience necessary to achieve even the most dramatic looks. This type of epoxy flooring is popular for home garages, basements, and public areas of commercial buildings like lobbies, waiting rooms, hotels, restaurants, and storefronts. Love the look of wood but don’t want to deal with the upkeep and worry over scratches, moisture, and pests? Concrete that looks like wood is a cost-effective, attractive, and long-lasting solution. We use specialized techniques to give you a concrete wood floor that looks like the real thing with all the durability and worry-free care of concrete. 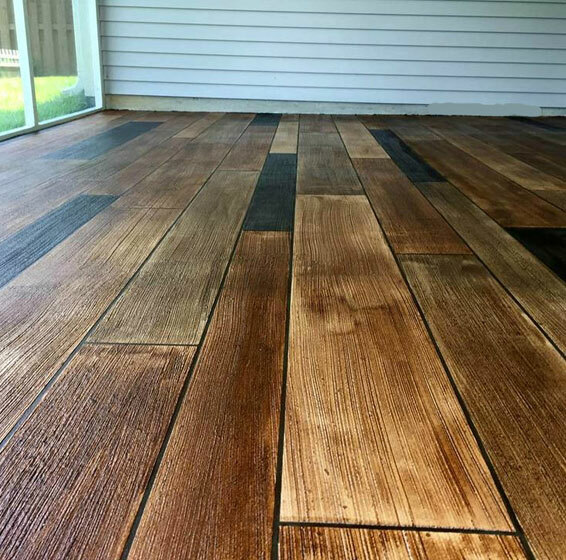 Wood stamped concrete combines stains and stamping to mimic the color, texture, and plank lines of wood. We can also use a broom and trowel method with stains for interior concrete to give you an authentic faux wood look. Want to extend the life of your concrete? Contact us about cost-effective concrete sealing in Fort Wayne, Indiana. Exterior concrete subject to freeze-thaw cycles benefits from a quality sealer because concrete is very porous and readily absorbs water. When the temperature drops, this liquid trapped in the concrete freezes and expands, causing extensive cracks over time. Professional concrete sealing can protect your concrete against freezing moisture as well as damage and discoloration from salt, fertilizer, and chemicals. Don’t let moisture concerns lead to a damp, musty basement that’s unusable or damages your belongings. As they are below ground level, basements are always prone to dampness, water run-off, and flooding. Effective basement waterproofing in Fort Wayne begins by diagnosing the problem and using the right methods to stop the water. A variety of techniques like concrete sealers and waterproof concrete coatings can effectively seal water from seeping through your concrete and into your home. Epoxy concrete coatings are versatile but they are only designed for indoor use. If you want decorative concrete that can be used indoors or outdoors, “concrete wood” is a good option. We can create concrete that looks like wood with one of two techniques: traditional brushes or stamped concrete. 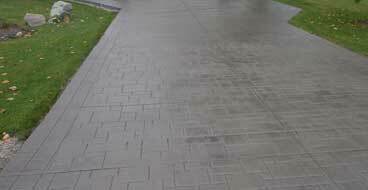 For existing concrete, both options will require applying a concrete overlay, or a thin layer of new concrete that can be imprinted and stained to give you a realistic wood grain and texture. 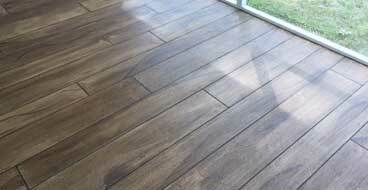 Wood stamped concrete in Fort Wayne can be used indoors for a concrete wood floor but it can also be used outdoors to give you the look and feel of a wood patio or pool deck without the maintenance, pests, or moisture concerns. Stamped concrete lasts just as long as regular concrete for decades of enjoyment. Not all epoxy and concrete sealing companies are the same. Here’s why you should work with Epoxy Flooring Fort Wayne for your next concrete project. Ready to see the possibilities with your dusty, dark garage or basement? Here are our most popular epoxy solutions for homeowners in Fort Wayne, New Haven, and surrounding communities. Imagine a basement free of musty odors, moisture problems, or carpet that just gets damp and mildewed. A basement epoxy coating is an effective, affordable way to transform your basement into a space you’ll love to use that’s free of moisture concerns and concrete dust. 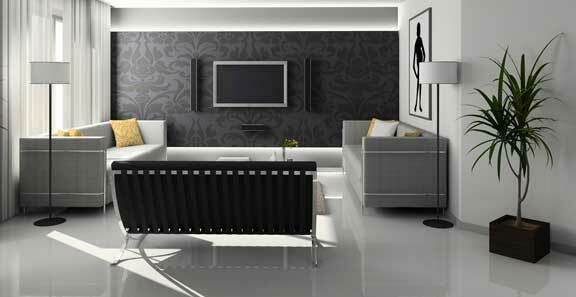 We offer unlimited design options to renovate your basement on your budget. Our epoxy garage floor installers can transform your garage into a bright, colorful space without the dust and ugly, stained concrete floor. Forget about DIY garage epoxy kits which come with low-grade products that don’t last more than a year or two. The possibilities are endless with professional garage floor epoxy. The beautiful results possible with metallic epoxy must be seen to be believed. A metallic epoxy garage floor delivers an out-of-this-world look that’s sure to make you the envy of the neighborhood. Metallic epoxy is also a great choice for a basement with movement and depth that can complement any design.